When oh when dear mainstream media will you ever learn to get off the same old script? Like actually including some skepticism of unverified claims as one might be so bold as to expect of professional "objective, unbiased" journalists? Is it too much to ask CNN to bring an ounce of critical evidence to claims - especially on highly socially divisive topics such as a heinous hate crime - instead of closing their eyes and parroting whatever is the story line du jour merely because of politically convenient narratives? How many embarrassing retractions, walk-backs, corrections, and deleted articles will it take? Instead we once again see CNN and virtually all other left-leaning mainstream outlets spreading legitimately fake news like wild-fire merely because a given narrative is politically and ideologically convenient to their corporate owners, because you know... MAGA. As Fox News' Brian Flood also remarks, "CNN is all in on the Jussie Smollett news... but they keep forgetting the part where he claimed attackers were Trump supporters." 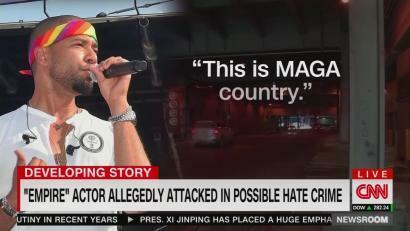 Indeed see for yourself CNN's initial wall-to-wall reporting of the now confirmed fake “this is MAGA country” supposedly racial and homophobic attack. As the story unraveled and as police began to prove it was obviously all a hoax, CNN went full-bore in the other direction, finally turning against the Empire star, with a panel of guests denouncing what what many suspected all along — that Smollett staged a hate crime hoax. And yet, CNN and other networks while attempting a collective mea culpa have still manage to blame Trump and his supporters. The Daily Caller's Chuck Ross notes that even amidst the embarrassing fallout, "Every single NYT, WaPo, CNN, NBC, CBS, etc. reporter who has commented on this topic has defended the dear journalists" — as in the ones who got the facts wildly wrong in the first place. The people who were repeating that quote were not news outlets...It was repeated by, sure, people who maybe had good intentions of wanting to spread the story...We can't confuse celebrity tweets with the media and the press. Remember this from last year? A video circulated of all the broadcasters saying the exact same thing based on Sinclair Broadcast Group, the nation's largest owner of local television stations, scripting the news for all its affiliates. "The beginning of the end of the Trump presidency..."
And guess what? There's often real life consequences of fake news for those not sheltered within the cozy offices of mainstream media corporate high rises. Maybe it's time for the major networks to collectively take a long (many might prefer permanent) pause, maybe a lengthy vacation for some much needed reflection and introspection? Yes CNN, the walls are closing in... on the mainstream media. Meanwhile perhaps it's time for CNN's "media janitor", Brian Stelter, who is oh so quick to point out the bias in every other network except his own, tackle the most difficult and embarrassing question: why were the mainstream - and fringe - journalists who were skeptical of Smollett's claims, attacked and forced to self-censor when the case was unfolding, and will continue to self-censor knowing that if they criticize Smollett directly they would be accused of homophobia and racism?